While healthcare providers try to screen and treat as many women as they can, 5,000 babies develop Rh disease in the U.S. every year. What do you need to know? The majority of women are Rh (Rhesus) positive—85% of Caucasian women, 90% of African-American women, and 98% of Asian-American women—but the rest are Rh negative. If you have a certain protein carried in your red blood cells, you’re Rh positive. Because the majority of babies are Rh positive, if the mom tests Rh negative, her blood cells won’t match the baby’s. If the baby’s Rh positive blood enters the mother’s system, her immune system could attack them. To prevent this Rh incompatibility, you may need a simple treatment during pregnancy to protect your baby and yourself. All pregnant women have their Rh factor tested, usually at their first prenatal visit. Your doctor will use blood samples taken from a vein in your arm to test your blood for Rh and a number of other conditions. If you test Rh positive, you don’t need to worry about compatibility. Even if your baby is Rh negative, your immune system won’t mobilize against the baby because fetal red blood cells don’t have foreign antigens. If you test Rh negative and your baby’s father is Rh negative, then your baby will be Rh negative, which is also fine: your body will not consider your baby foreign. If you test negative and your partner is Rh positive, your baby will probably receive the positive Rh factor from him, creating an incompatibility between you and your baby. You won’t know your baby’s Rh factor until the baby is born, but you have to assume it, just to be safe. In the first pregnancy, this isn’t a problem because it’s usually not until birth when a baby’s blood leaks into the mother’s, which triggers the mom’s body to produce antibodies. 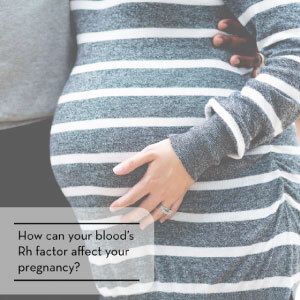 Once that happens, in future pregnancies, your antibodies could attack the Rh factor in your baby’s blood as if it’s foreign, destroying the red blood cells and causing anemia, which can result in jaundice, brain damage, and even death. What can you do? Fortunately, a drug called Rh immune globulin prevents you from becoming Rh-sensitized if it’s possible that your blood has been exposed to the baby’s blood. There’s no harm in getting the Rh immune globulin shot, even if it’s not needed. How does the shot prevent you from developing antibodies? The Rh immune globulin shot contains a small dose of antibodies. These antibodies kill any Rh-positive blood cells in your system, which keep your immune system from developing its own antibodies. The dose isn’t large enough to cause problems for your baby. For the shot to work, you need to receive it no more than 72 hours after any potential exposure to your baby’s blood. The protection will last for 12 weeks. If your doctor suspects that more than an ounce of your baby’s blood mixed with yours, you might need a second shot. You’ll get the injection in the muscle of your arm or buttocks. While you may have some soreness, there are no other known side effects. It’s very unlikely that Rh incompatibility will affect women who receive good prenatal care and who receive Rh immune globulin when necessary. Even without treatment, your chances of developing the antibodies and becoming Rh-sensitized are only about 50% even after several Rh-incompatible pregnancies. Once you’re sensitized, however, you have the antibodies forever. And you produce more with each pregnancy, so the risk of Rh disease is higher for each baby. The good news is that doctors are finding new ways to save babies who develop Rh disease. Your doctor can track your level of antibodies and keep tabs on your baby’s condition during pregnancy to see whether he or she’s developing the disease.